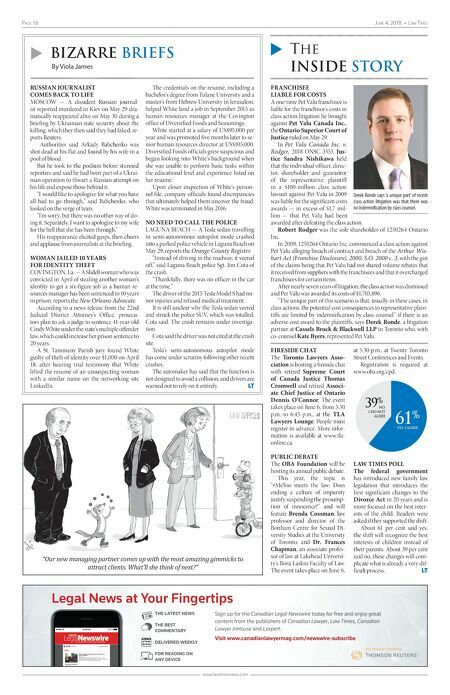 Page 16 June 4, 2018 • Law Times www.lawtimesnews.com FRANCHISEE LIABLE FOR COSTS A one-time Pet Valu franchisee is liable for the franchisor's costs in class action litigation he brought against Pet Valu Canada Inc., the Ontario Superior Court of Justice ruled on May 29. In Pet Valu Canada Inc. v. Rodger, 2018 ONSC 3353, Jus- tice Sandra Nishikawa held that the individual officer, direc- tor, shareholder and guarantor of the representative plaintiff in a $100-million class action lawsuit against Pet Valu in 2009 was liable for the significant costs awards — in excess of $1.7 mil- lion — that Pet Valu had been awarded after defeating the class action. Robert Rodger was the sole shareholder of 1250264 Ontario Inc. In 2009, 1250264 Ontario Inc. commenced a class action against Pet Valu alleging breach of contract and breach of the Arthur Wis- hart Act (Franchise Disclosure), 2000, S.O. 2000 c. 3, with the gist of the claims being that Pet Valu had not shared volume rebates that it received from suppliers with the franchisees and that it overcharged franchisees for certain items. After nearly seven years of litigation, the class action was dismissed and Pet Valu was awarded its costs of $1,703,896. "The unique part of this scenario is that, usually in these cases, in class actions, the potential cost consequences to representative plain- tiffs are limited by indemnification by class counsel" if there is an adverse cost award to the plaintiffs, says Derek Ronde, a litigation partner at Cassels Brock & Blackwell LLP in Toronto who, with co-counsel Kate Byers, represented Pet Valu. FIRESIDE CHAT The Toronto Lawyers Asso- ciation is hosting a fireside chat with retired Supreme Court of Canada Justice Thomas Cromwell and retired Associ- ate Chief Justice of Ontario Dennis O'Connor. The event takes place on June 6, from 5:30 p.m. to 6:45 p.m., at the TLA Lawyers Lounge. People must register in advance. More infor- mation is available at www.tla- online.ca. PUBLIC DEBATE The OBA Foundation will be hosting its annual public debate. This year, the topic is "#MeToo meets the law: Does ending a culture of impunity justify suspending the presump- tion of innocence?" and will feature Brenda Cossman, law professor and director of the Bonham Centre for Sexual Di- versity Studies at the University of Toronto, and Dr. Frances Chapman, an associate profes- sor of law at Lakehead Universi- ty's Bora Laskin Faculty of Law. The event takes place on June 6, at 5:30 p.m., at Twenty Toronto Street Conferences and Events. Registration is required at www.oba.org/cpd. 39 % NO, I DO NOT AGREE YES, I AGREE 61 % LAW TIMES POLL The federal government has introduced new family law legislation that introduces the first significant changes to the Divorce Act in 20 years and is more focused on the best inter- ests of the child. Readers were asked if they supported the shift. About 61 per cent said yes, the shift will recognize the best interests of children instead of their parents. About 39 per cent said no, these changes will com- plicate what is already a very dif- ficult process. LT u Bizarre Briefs By Viola James u The InsIde story "Our new managing partner comes up with the most amazing gimmicks to attract clients. What'll she think of next?" RUSSIAN JOURNALIST COMES BACK TO LIFE MOSCOW — A dissident Russian journal- ist reported murdered in Kiev on May 29 dra- matically reappeared alive on May 30 during a briefing by Ukrainian state security about the killing, which they then said they had faked, re- ports Reuters. Authorities said Arkady Babchenko was shot dead at his f lat and found by his wife in a pool of blood. But he took to the podium before stunned reporters and said he had been part of a Ukrai- nian operation to thwart a Russian attempt on his life and expose those behind it. "I would like to apologize for what you have all had to go through," said Babchenko, who looked on the verge of tears. "I'm sorry, but there was no other way of do- ing it. Separately, I want to apologize to my wife for the hell that she has been through." His reappearance elicited gasps, then cheers and applause from journalists at the briefing. WOMAN JAILED 10 YEARS FOR IDENTITY THEFT COVINGTON, La. — A Slidell woman who was convicted in April of stealing another woman's identity to get a six-figure job as a human re- sources manager has been sentenced to 10 years in prison, reports the New Orleans Advocate. According to a news release from the 22nd Judicial District Attorney's Office, prosecu- tors plan to ask a judge to sentence 41-year-old Cindy White under the state's multiple offender law, which could increase her prison sentence to 20 years. A St. Tammany Parish jury found White guilty of theft of identity over $1,000 on April 18, after hearing trial testimony that White lifted the resumé of an unsuspecting woman with a similar name on the networking site LinkedIn. The credentials on the resumé, including a bachelor's degree from Tulane University and a master's from Hebrew University in Jerusalem, helped White land a job in September 2015 as human resources manager at the Covington office of Diversified Foods and Seasonings. White started at a salary of US$95,000 per year and was promoted five months later to se- nior human resources director at US$105,000. Diversified Foods officials grew suspicious and began looking into White's background when she was unable to perform basic tasks within the educational level and experience listed on her resumé. Upon closer inspection of White's person- nel file, company officials found discrepancies that ultimately helped them uncover the fraud. White was terminated in May 2016. NO NEED TO CALL THE POLICE LAGUNA BEACH — A Tesla sedan travelling in semi-autonomous autopilot mode crashed into a parked police vehicle in Laguna Beach on May 29, reports the Orange County Register. "Instead of driving in the roadway, it veered off," said Laguna Beach police Sgt. Jim Cota of the crash. "Thankfully, there was no officer in the car at the time." The driver of the 2015 Tesla Model S had mi- nor injuries and refused medical treatment. It is still unclear why the Tesla sedan veered and struck the police SUV, which was totalled, Cota said. The crash remains under investiga- tion. Cota said the driver was not cited at the crash site. Tesla's semi-autonomous autopilot mode has come under scrutiny following other recent crashes. The automaker has said that the function is not designed to avoid a collision, and drivers are warned not to rely on it entirely. LT Legal News at Your Fingertips Sign up for the Canadian Legal Newswire today for free and enjoy great content from the publishers of Canadian Lawyer, Law Times, Canadian Lawyer InHouse and Lexpert. Visit www.canadianlawyermag.com/newswire-subscribe THE LATEST NEWS THE BEST COMMENTARY DELIVERED WEEKLY FOR READING ON ANY DEVICE Untitled-2 1 2018-05-01 1:55 PM Derek Ronde says 'a unique part' of recent class action litigation was that there was no indemnification by class counsel.